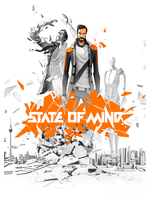 We first saw State of Mind 2 years ago in Cologne during Gamescom and it made quite an impression on us at the time. Then the game remained pretty discrete, at least here on Gamersyde, until its launch date was announced a few weeks back. The game will be available in 2 days on PC, PS4, Xbox One and Nintendo Switch, but as we were sent a copy early, here's our verdict in a full review. Enjoy! The future has always fascinated the most iconic authors in literature, movies and video games, but the subject seems to have gotten even more attention in the past few years. Today’s technological progress has shed light on the potential backlash that is bound to happen sooner or later. How far will Man go? What will cause his inevitable demise? Those questions are usually at the very core of the stories science-fiction fans love so much. Transhumanism, robotics, artificial intelligence, where will it leave us humans? In many novels/movies/games, the future is usually shown in a pretty dark way, and clearly Martin Ganteföhr’s take on it is not more optimistic. In 2048, wars and international tensions are getting more and more frequent, pollution levels have reached such peaks that their effect on health can be seen everywhere and men and women are replaced by machines more and more often. The characters of State of Mind have to live in this social, scientific and political mess of a world, like Richard Nolan, one of the very few journalists to openly criticize the downward spiral of technological progress. Richard has had to face a few ordeals in his life, which explains why he’s not really the easy-going sort of main character. The game opens up as he wakes up in a hospital bed after a car accident. Still a bit shaken up by what happened to him, he suffers from partial memory loss, but his return home does not bring him comfort at all. His wife and son are gone and to make it worse, an android breaks the news to him. Richard hates robots, he doesn’t understand why his wife Tracy bought one without telling him. Apparently, she went to visit her parents with James, their son, something which doesn’t come as a surprise considering the problems they’ve been having in their relationship recently, but still, timing isn’t the best. On the other hand, Adam Newman seems to have it all, a loving wife, Amy, and a son, John. True, he doesn't get to see Amy as much as he’d like to, but she’s so passionate about her work that it’s hard to blame her. As for John, he’s a good kid without a doubt, but his health is a bit fragile and this obviously worries his father. Although not much seems to brings them together, Adam’s and Richard’s lives are bound to collide and it actually starts with that car accident we mentioned earlier. Adam was also involved in it, and when his story begins, he wakes up at home with the hologram of his doctor standing next to him. State of Mind will not only let you play as the 2 men, as you will also impersonate a few other characters, but Richard and Adam will however be the 2 main protagonists you will spend most of your time with. Much like in GTA V, you will even be able to switch from one to the other almost every time you want, but the two of them will need one another to progress in their respective plots which, as you can imagine, are deeply intertwined. You know us, we’re not the kind to reveal too much of the story so we won’t say anything more about it. Suffice to say that we have not been disappointed by the plot, even though we had pretty high expectations before playing - they came immediately after we met Martin Ganteföhr at Gamescom in 2016. The first reason that makes the game so appealing is its impressive art style, which mixes realistic landscapes with character models made with visible polygons. Because of that peculiar visual style, it’s hard to mistake the game for another one. Berlin, New York City, City5, don’t expect to travel a lot in State of Mind, but be sure that all the different places you will explore will be worth it visually, with great atmosphere and very nice introductory cutscenes. The cinematics are actually quite reminiscent of the work of 2 developers of the 90s, Eric Chahi and Paul Cuisset, and maybe that’s why we enjoyed them so much. The camera angles are always carefully chosen and we even found the few slowdown effects to be much better integrated than in some of the cult Japanese games of the early 2000s. The areas which can be visited are obviously pretty limited in terms of space, but a lot of attention has been put in all the details to make them very lively. You will then see various NPCs all around, traffic in the background, police robots being dropped by futuristic choppers to secure a place, all this making the game very immersive despite its small budget. The second aspect that is undeniably important in a story-driven game is the soundtrack and sound design in general. To begin with, the OST is in perfect keeping with the cyberpunk world created by Martin Ganteföhr. There is often a sense of melancholy in the few piano tracks that are featured in the game, but there is also more orchestral music that kicks in when necessary and it sounds great. Voice acting is also very solid, though we must confess we were a bit worried the actors and actresses might not deliver a believable performance at first. It may be true for some of them, but overall, they’ve done a terrific job. Those of you who are used to playing Daedalic games will say it is no real surprise, but it’s still a relief as bad voice-acting would have hurt Martin Ganteföhr’s writing so much. It’s just a bit of a shame that the dialog sequences should be so static compared to the well-crafted cutscenes. Despite that, finding out more about Richard Nolan’s story is really interesting, his past really being important in the way the narration is built. It’s also a good thing that he’s not presented as a knight in shining armor, he’s just as flawed as we are, if not more in some cases. All this is very well of course, but what about the gameplay aspect of State of Mind you will ask. It goes without saying that you should not expect deep challenging mechanics in such a game. 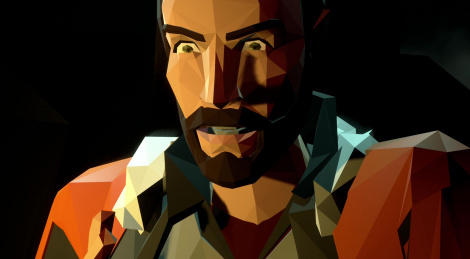 It does not mean that you are going to play another Telltale title lookalike. First, although you will be asked to make a couple of choices toward the end of the adventure, State of Mind is not a game where you are going to weigh on the story, except for those few decisions we just mentioned. Then, however simple they may be to tackle, the different situations are quite varied: you will be hacking devices via a very simplistic mini-game on a few occasions, you will have to remain stealthy from time to time (in Blimblim-friendly sequences mind you) and several times, you will need to find the 3 correct clues among different files found in a computer. Those are just a few examples to give you an idea, but like we said, there is quite a lot of variety. The game is clearly not a point-and-click however, so don't expect any real challenge or big puzzles. That being said, it isn’t a walking simulator either, more something in between (a modern adventure game some might call it). With the number of story-driven games that have been released in the past 6 years or so, it’s not surprising to be a little wary when comes a new challenger, even when it does without relying on the usual episodic format. State of Mind’s story does not have to force players to wait for several months to prove it can be engaging, and for that we are thankful. As an outsider that almost pops out of nowhere, Martin Ganteföhr’s title definitely has what it takes to knock down many of its competitors with its brilliant art style and its captivating plot and characters. State of Mind is not just some random alternative to the genre, it’s a great example to follow, with cutscenes that even manage to surpass anything Telltale ever tried to achieve in their cinematographic approach to presentation. Daedalic took their time to release the game, but it was worth the wait as it’s a real tribute to the most famous sci-fi stories we love. For that reason, you should absolutely take the time to discover State of Mind before the avalanche of September releases begins. push square didn't seem to like this much at all. but i think i'm sold, love the setting and style. just wish it came on disc. for that reason i'll probably hold off on buying until it's WAY cheaper on PSN, because it's unusually expensive for this type of game at the moment. There's a box version on Switch, saw it this morning in a shop, are you sure it's not the case for the other systems? there's evidence it may exist in some european countries? (i've seen PS4 box art with a large green USK rating sticker which we don't have here in the UK) but i can't seem to find it on any of the usual places i shop for games. i guess it's a very limited release? Any chance you can check out the switch version? Sadly no, we were only sent a PC code.